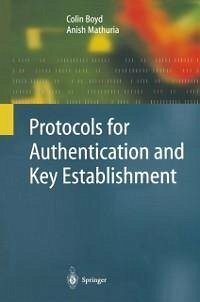 Protocols for authentication and key establishment are the foundation for security of communications. The range and diversity of these protocols is immense, while the properties and vulnerabilities of different protocols can be remarkably subtle.Here is a comprehensive and integrated treatment of protocols for authentication and key establishment. It allows researchers and practitioners to quickly access a protocol for their needs and become aware of existing protocols that have been broken in the literature.As well as a clear and uniform presentation of the protocols, this book includes a description of all the main attack types and classifies most protocols in terms of their properties and resource requirements. It also includes tutorial material suitable for graduate students. 1 A Tutorial Introduction to Authentication and Key Establishment.- 2 Goals for Authentication and Key Establishment.- 3 Protocols Using Shared Key Cryptography.- 4 Authentication and Key Transport Using Public Key Cryptography.- 5 Key Agreement Protocols.- 6 Conference Key Protocols.- 7 Password-Based Protocols.- A Standards for Authentication and Key Establishment.- A.1 ISO Standards.- A.1.1 ISO/IEC 9798.- A.1.2 ISO/IEC 11770.- A.1.3 ISO 9594-8/ITU X.509.- A.2 Other Standards.- A.2.1 IETF Standards.- A.2.2 IEEE P1363-2000.- A.2.3 NIST and ANSI Standards.- B Summary of Notation.- References.- Index of Protocols.- General Index.